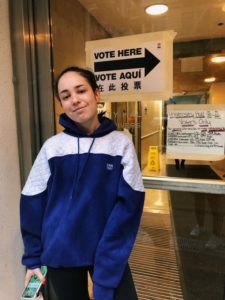 “Voting today was not easy for me because I was originally registered in Florida and the whole process to get registered in New York was incredibly difficult and took a lot of time and effort. It really felt like there were a million things trying to stop me from voting today, which should be a pretty simple thing to accomplish in America. It’s our right. But with everything that’s at stake and the difficulties that our country has been going through, it felt like something that I really needed to do and I’m glad I made it out.” Sophia Duenas, 20, student, Union Square resident, from Miami, Florida.